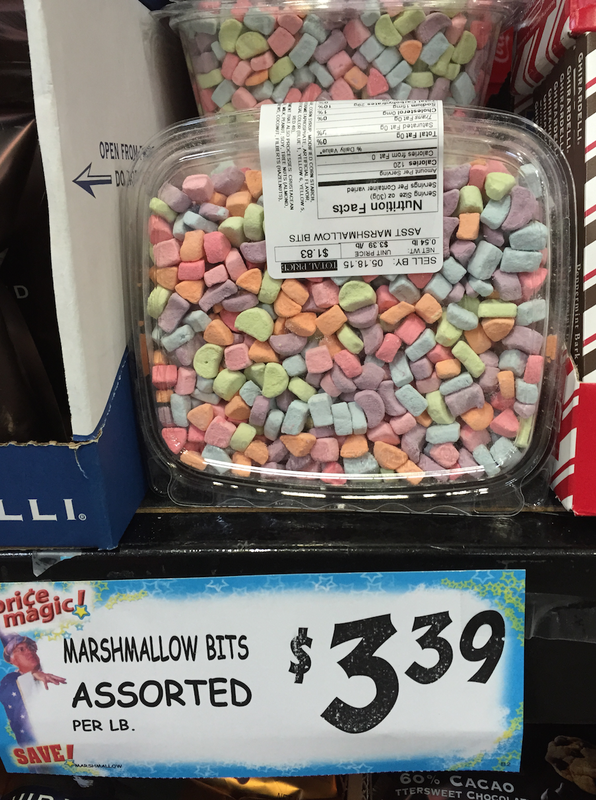 A giant tub of Lucky Charms marshmallows for $1.83. (Found at Jungle Jim’s International Market outside Cincinnati). 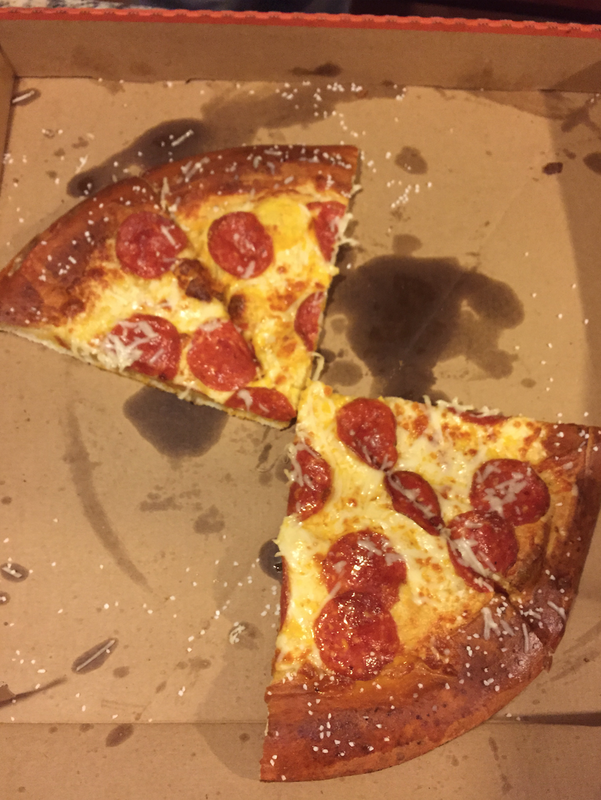 And it was glorious, although if you’re listening, Little Caesars, it would be 10x better if you substituted ham or bacon for the pepperoni, because the pepperoni completely overpowers the cheese sauce and pretzel crust instead of complementing it like bacon or ham would. Just a suggestion. I also baked a crap-ton of cookies, but for the first time, did not photograph them. Also for the first time I remembered how much I hated everyone and everything after decorating cookies for hours last year, so I perfected a quick and easy method. It still tasted amazing though, which is really what matters. 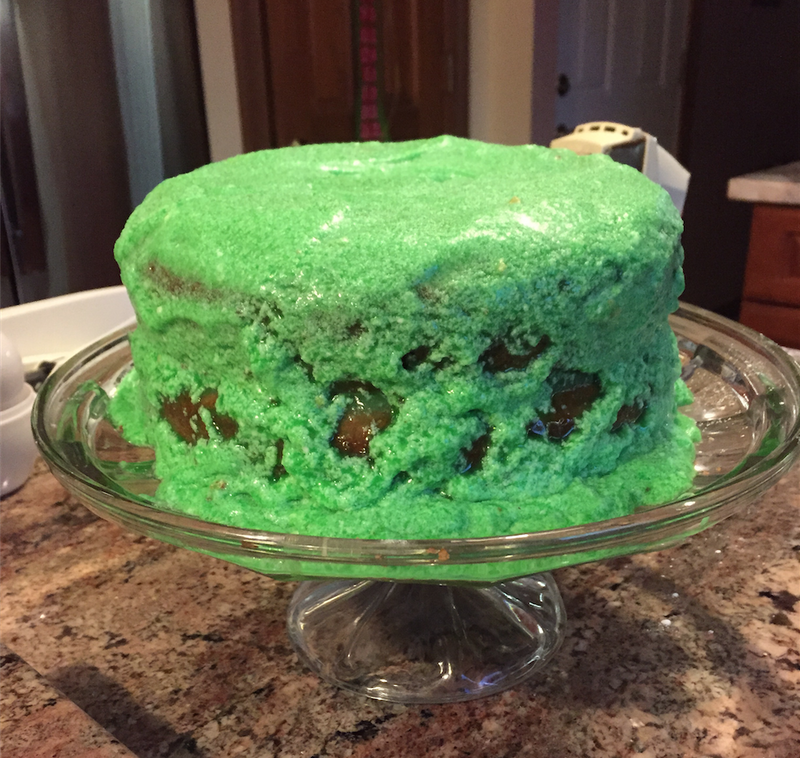 I think most people would prefer an ugly cake that tastes delicious than a beautiful tasteless creation, right? 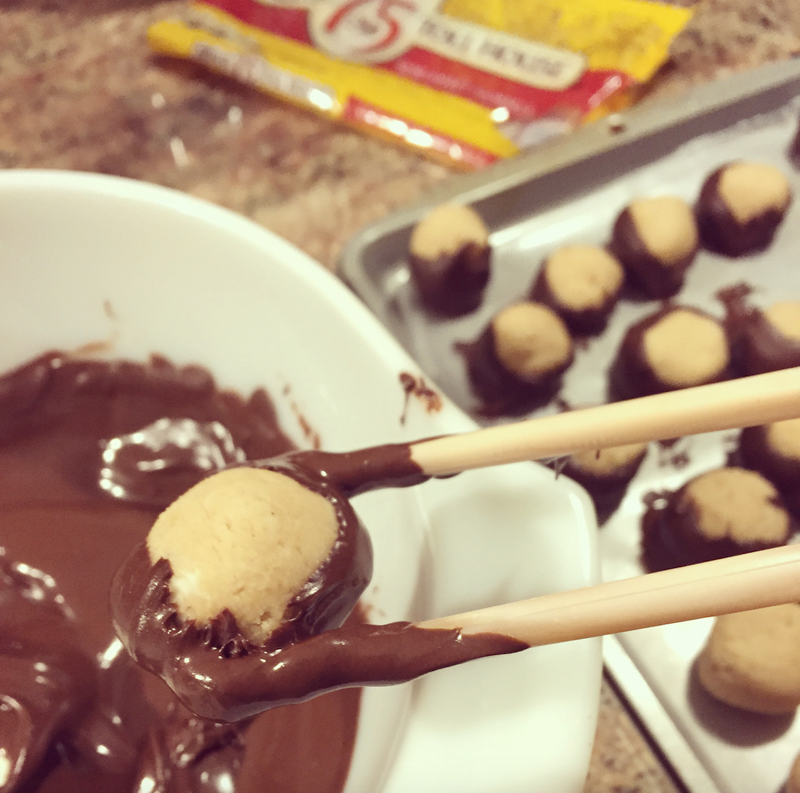 I knew my mad chopsticks skills would come in handy some day! 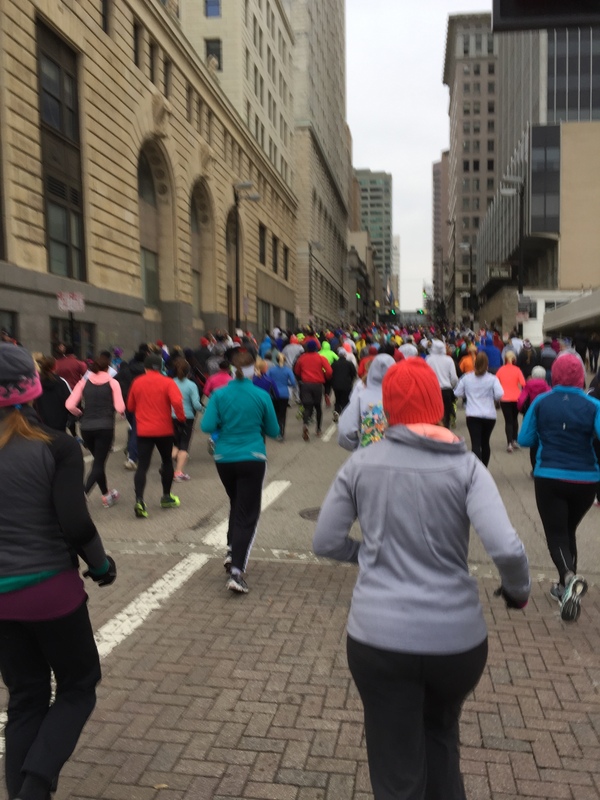 So on Thanksgiving Day (which was somehow almost 3 weeks ago) I ran my second ever 10K race. If you remember from my recent posts, I was really hoping for a sub-hour time. Sadly, that didn’t happen, and I have a whole host of excuses to explain why. Excuse #1: I got attacked by a dog the day before. Alright, I’m making it sound worse than it was. On the Wednesday before Thanksgiving, the day after I arrived back in the US, I decided to do a short run around my parents’ neighborhood to make sure my race day kit (American English: outfit) was warm enough (see Excuse #2). I was wearing mountain trekking socks, calf compression sleeves, thermal pants and pug leggings, so my calves were essentially covered in 4 layers. My lungs were burning from the cold (it was about 30 degrees, or -1 C), but my body felt warm enough. As I was running I noticed a man and his boxer puppy jogging toward me. My first thought was “huh, a Steelers sweatshirt, you don’t see too many of those in Bengal territory,” followed shortly by “Ow!” as the puppy playfully jumped up on my leg. The guy kept running, perhaps not even noticing what happened, as did I, as it seemed like a harmless puppy pounce. But as I jogged on I felt a slight pain, and when I finally got home and removed all 4 layers from my leg, I saw a huge (like the size of a grapefruit!) bruise on my calf, along with a cut. I’m still not sure if it was a bite or a scratch — it happened so fast — and I can’t believe either would leave such a big and painful mark. I iced and bandaged it and it felt alright, but I’m still using it as an excuse for my race day performance. 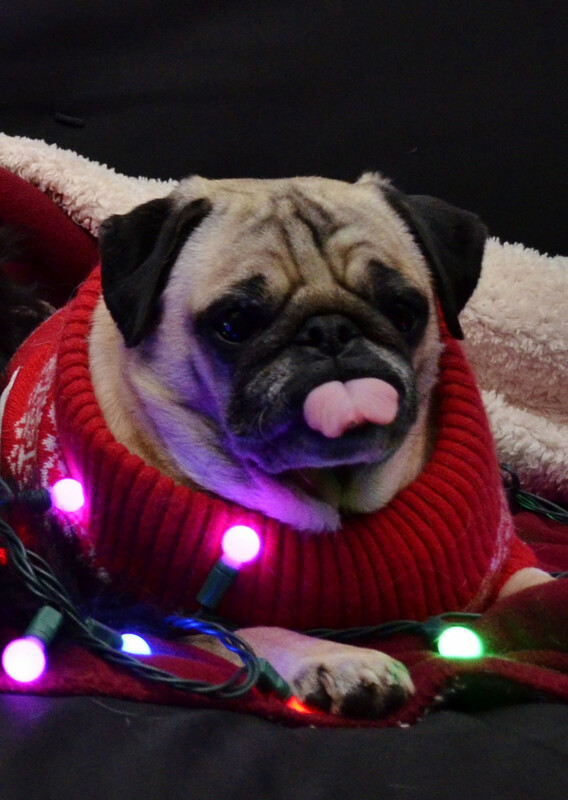 Excuse #2: It was freaking cold. When I left London at the end of November it was mid-50s (12 C). It was chilly, but not cold. It was actually near-perfect running weather. It wasn’t until the day before I left that I actually wore any of my thermal clothing on a run. The morning of the race it was 30 degrees (-1 C), which is a big difference when you’ve been training in 20 degrees warmer. Even with my thermal layers, gloves, headband and snood, my lungs were frozen. Excuse #3: London is pancake flat. I never realized how flat London’s royal parks are until I ran in Cincinnati and Kentucky. The slightest incline kills me. The hills in the race were described as “rolling,” and truly, to anyone experienced in running anywhere besides London, they probably weren’t that bad, but since I did the majority of my training on completely flat roads, I struggled. I even broke my rule and walked up a couple of the bridges. Excuse #4: My pants kept falling down. Since I started running a year and a half ago, I have worn the same £2 LA Gear shorts. In the winter I wear them over my leggings since I need the pockets for tissues. They have always served me well. Yet on race day they started falling down after mile 1 and I had to continually pull them up. It’s never happened to me before and hasn’t happened since, so it was a total fluke. Those are my main excuses. You could also add there were a crapload of people walking and running and the coral system isn’t that great, so even if you line up with your estimated mile time, you still end up dodging walkers. I took this shot right after the start. There’s always next year to reach my goal, or I should try a 10K race in London where it’s flat and warmer! I finally had to cave and create a “To Do” list. If you haven’t noticed, I haven’t posted since I’ve been back in the U-S-A, because I haven’t had many free minutes to myself. 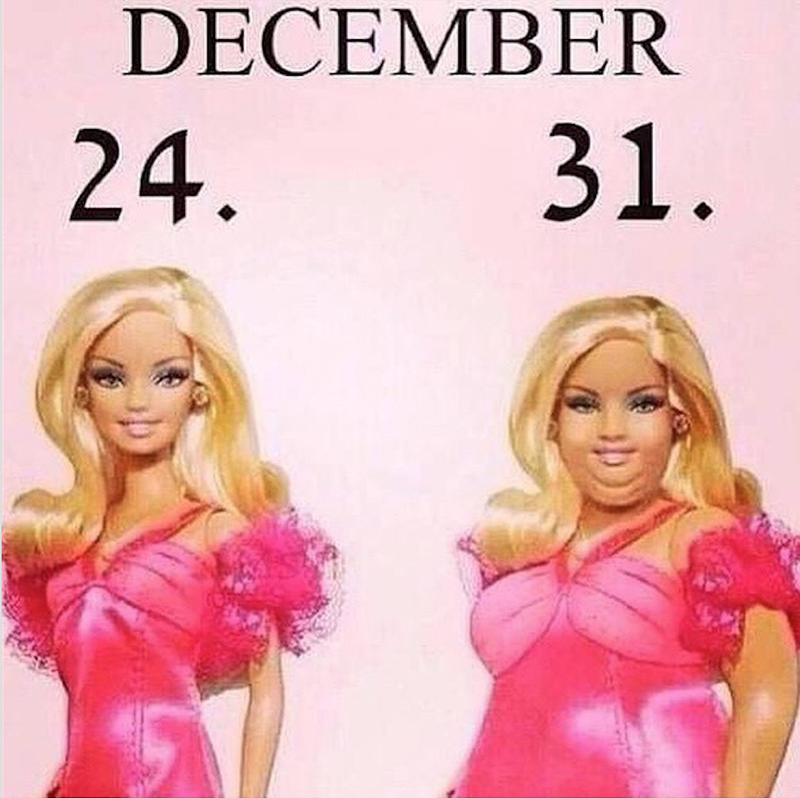 It’s a challenge trying to balance working from home practically full time, exercising, eating all the food, buying all the things and spending time with family and friends. But they say you make time when something is really important, so since Thursday I’ve been obsessively trying to track down a FitBit Charge HR. My regular readers may know my obsession with my Fitbit Force. That’s something else I should add to the list of time-eating activities above — trying to hit 10,000 steps everyday when it’s cold outside. The floors of my parents’ house are soon to be as well-worn as my flat’s. I cannot live a day without my fitness tracker, but my Force is on its last legs. It’s been super glued together multiple times. 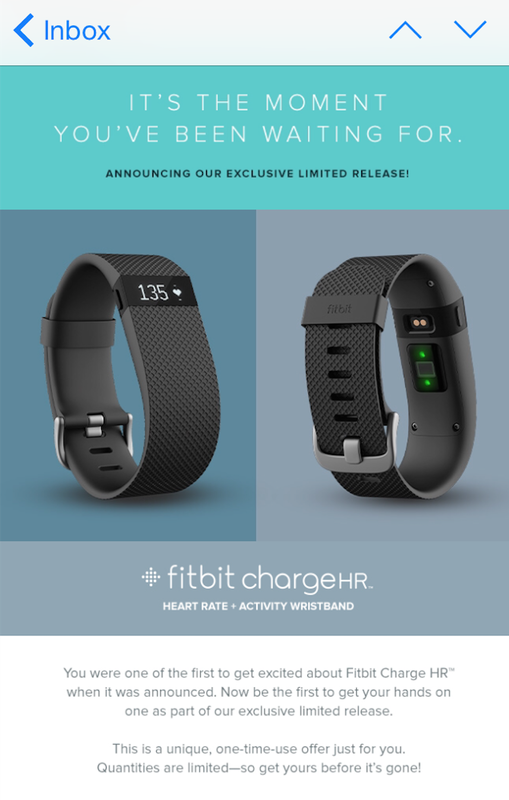 I was excited when Fitbit announced the Force’s replacement, the Charge, and even more excited about the Charge HR. OK, excited is an understatement — I HAD TO HAVE ONE. It has all the functions of my Force, plus continuous heart rate monitoring. 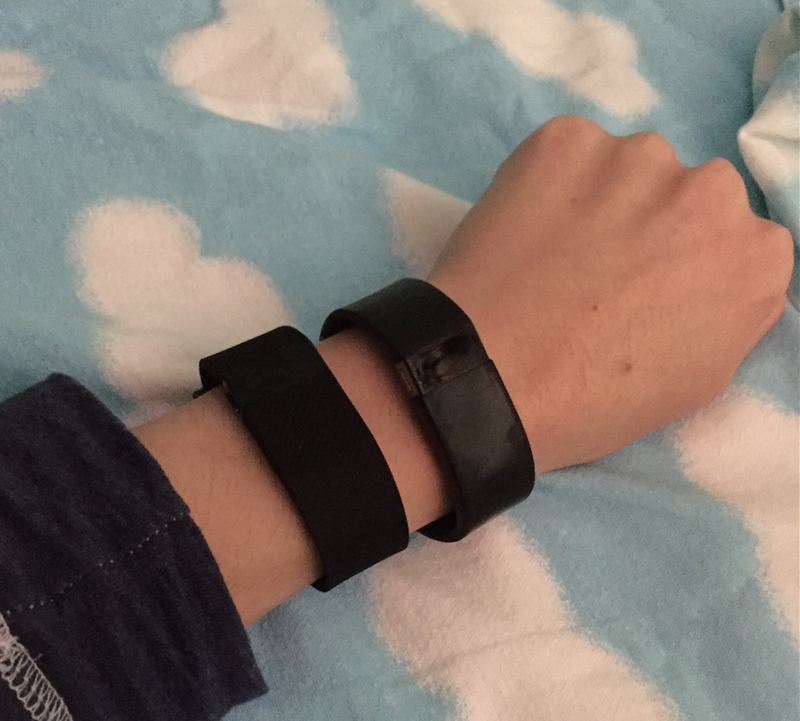 I know wrist heart rate monitoring is likely not very accurate, but still, I must know if my heart rate raises and I burn extra calories baking cookies and shoveling snow and other activities that do not require a swinging arm. 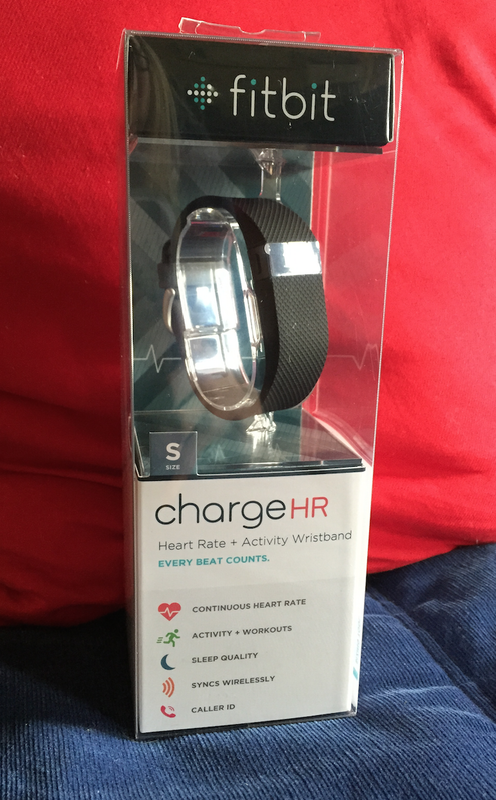 My Force served me well over the year, but I’m excited for life with the Charge HR.